Two Home Redos. The Gift that keeps on Giving. Amid the hustle and bustle of everyday life, home has become a personal refuge. We live in a crazy world and our home should be our sanctuary. Disorganization takes away from the tranquility of our personal space. Here are two upgrades that are sure please and calm. A well-organized laundry space is the “gift that keeps on giving”. You can enhance laundry room space by installing shelving and cabinetry surrounding the washer and dryer. 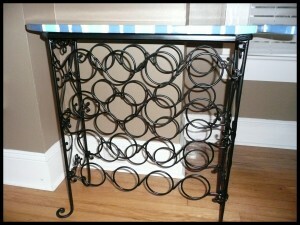 It does not have to be expensive; it’s the perfect DIY project. Consider what can be stored in that space: laundry detergent, other household cleaners, an iron and an ironing board, towels, bedding, and of course, dirty laundry.Add bins or baskets for instant clothes sorting. A big enhancement, if there is room, is the addition of a rolling table for folding laundry or doing arts and crafts projects. For smart storage I recommend dedicated towers or cubes for each member of the family even one for pets. 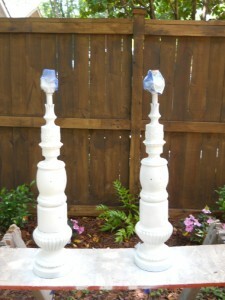 Add names to them and place them near a widely used entrance. They are great for creating a convenient system for sorting jackets, backpacks, mail, keys and leashes. Lately I have had lamps on my brain. Big ones, small ones and everything in between. In addition to the utilitarian reasons we use lamps, I have found they do have personalities all their own, and can make a statement in any room. 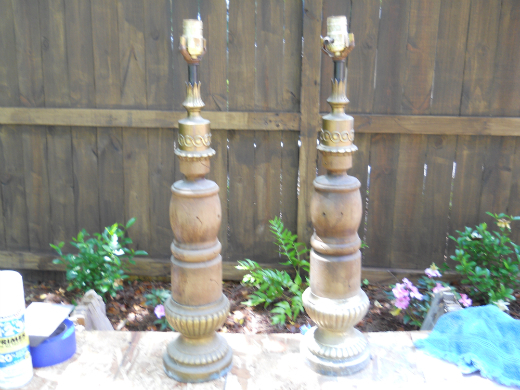 One afternoon as we were cleaning out my mothers attic after her passing, I came across this old pair of Ethan Allen lamps from the 60’s. They were solid wood with a dark stain and I remembered seeing them in our living room as a child. They certainly were very fashionable for the time, but now needed some serious revamping. Those of you that have followed us here at SouthernSmarts.com you all know I do enjoy designing with color. For inspiration on this project I used the sea. 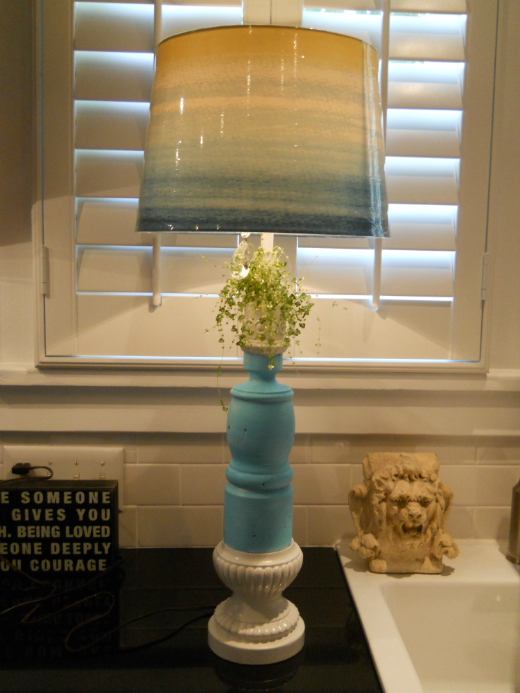 I love the beach, and thought they would make some interesting table lamps for a smart beach place. Always budget conscious I was going to have to create something with minimal cost. First, I sanded them with a fine grade sandpaper so they would hold a good primer. I used a spray primer applying very light coats until they were completely covered. The faux brass base and top had to go. I used a high gloss off white paint applied with a small brush, while being careful not to leave brush marks. It was now time for color, and after much thought I decided to use a wonderful turquoise semigloss interior paint that I happened to have in the garage. I did not want a heavy painted finish, as there are some wonderful markings on the lamps themselves, so I decided on a Turquoise wash. I used a little paint and thinned it with water and applied the color with a small rag, carefully controlling how much paint went on at a time. Upon reaching the desired effect I was through. The next step was a bit difficult. I had to find the perfect shades. I looked everywhere, and finally on my last stop at my local Target, I found them. The shades remind me of the horizon as you look out over the ocean, and they could not have been more perfect. They were 14.99 a piece, and my wallet was happy. The final touch were these little beads I had found at a cool shop in Southport and have crystal droplets that turn them on and off by pull chain. 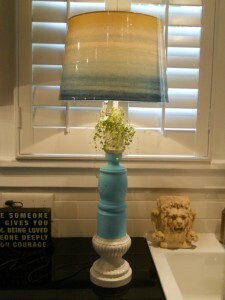 I now have a really cool pair of lamps that I can’t wait to take to beach. And the fact that they were my moms makes them that much more special. I feel like I have a part of her there, and I can’t put a price on that. Finding the Joy in the Journey. When life suddenly scaled things down with the subtlety of an F5, I had to regroup on most things. Gone were the days of chartered boating, upscale resorts, and divine city dining. This lifestyle change may have adjusted my itinerary, but it has not changed my wanderlust, and curiosity for what may be around the next bend. Therefore, In my travels, I have reached out, and made incredible journeys into my own. Locally, I have discovered an ethereal coastal compound for wild horses, that have inhabited this extraordinary island for hundreds of years. I happened on a bird sanctuary, that rehabilitates birds of prey, and fosters and guards its local eco system. I have toured historic buildings to better understand my local history. I have happened on locally grown treats at state highway roadside markets, that make it more than worth the diversion. I have found characters in small, rural towns, that have turned their passions into content for national documentaries. I have enjoyed views from day hikes that can be postcard perfect, and sunset kayak excursions on local rivers, that would be worth a much longer trip. Boy, didn’t some of us have a difficult emotional past that has cut hard and deep into the very thread of our present lives. I would say that I qualify for that tee-shirt! My past war wounds are more visible some days than others and it takes a constant effort on my part to keep them hidden. I do not need to show off a badge of courage. What I am trying to say is, I had a past that might have led me to think that I would always be destined for heartache, disappointment, and the feeling of living with a broken spirit. But I decided long ago that I am worthy of true happiness and that I can make it so. 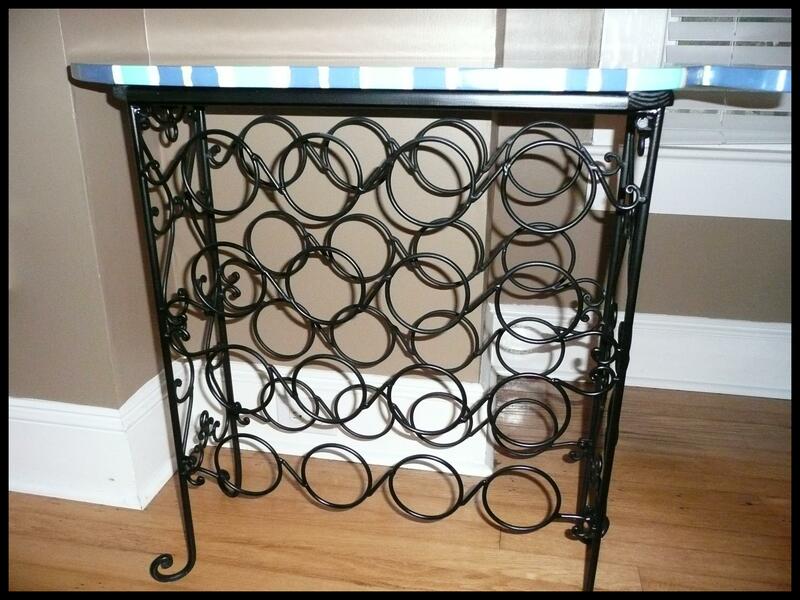 OK, Chabby asked me to share how I made my fish table… This project started with my neighbor sitting one of those little wine rack tables, we’ve all seen before, on the curb…free to a good home…with a plan in mind, I scooped it up…We were in need of a table that could live on the front porch with the rockers, a place for appetizers when we are hanging out…So this is what I did…First, I flattened out a cardboard box so I could make a pattern for my fish. 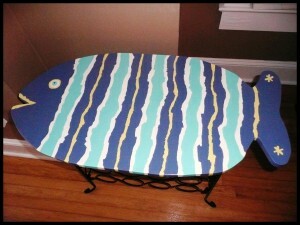 That way I could create the right size of fish to fit over the existing table top. I decided to leave the original top on the rack because it was sturdy and well attached. After I got my fish drawn, I cut around it leaving about a 2 inch margin so I could have the ability to tweak the final shape, to make sure I liked the shape and more importantly that it covered the existing top. I then realized that I would need to nip off the corners of the original top to accommodate the roundness of the fish otherwise my fish would’ve had to be a lot bigger. So now I have my pattern and I went to Lowes to look for a piece of wood. I was hoping to be able to purchase a small piece of plywood instead of a whole sheet but what I found was much better. They had small finger jointed wood in three or four different dimensions, pre-sanded, suitable for a table top. The wood is not a hardwood so you have to be ok that it will get dinged easier and just consider that part of its future character. Back home, I laid the pattern on the wood and traced my fish, then used a jigsaw to cut it out. Because it is a softer wood, it was easy to cut and the I took a piece of 220 sandpaper and sanded the edges. Then I used the jigsaw to cut the corners off of the original table and I drilled 4 holes so I could attach the screws to the fish from underneath. A little secret I learned a long time ago, is that when screwing two pieces of wood together it is important to pre-drill the first piece of wood for the screw to slide through the hole and only bite the second piece of wood, otherwise they will push away from each other. I then attached the fish adding some wood glue before screwing it together. It’s time to pick my colors… I looked around my kitchen and saw a few pieces of fiesta ware grouped together…and decided to use 4 of those colors…so off to Lowes again…I picked paint chips that matched my colors and had them mix samples for under $3.00 a color. This is the best deal ever!!! Back home, I am ready to design…I drew on my pattern till I figured out what how I wanted to paint the fish. I used leftover interior latex primer to prime all the raw wood first. Then I turned the table upside down and sprayed the underneath black (Rustoleum Satin Finish Enamel). I wanted the underneath to seem to disappear, so when you were sitting down, all you would notice was the color. To apply the paint I used a combination of sponge and small (cheap) artist brushes. I applied the primer and most of the first coat with the sponge brushes and used the artist brushes for the second coat and the eye. It needed a second coat to make the colors really pop. Then I put three coats of clear polyurethane to seal the paint…I always wait at least a week or two before I use anything with poly on it, to give the polyurethane time to cure (ie. harden)…not sure if it really matters, it’s just what I do…and that’s it…we now have a fun table for the porch that cost less than $40.00…And my friends are amazed…You gotta love that :>)) Karen M.
This house needed to be what I call “un-remodeled”. Years ago someone thought it would be a great idea to enclose the front porch…NOT! I think that a porch is a porch… and that thinking goes double if you live in the south! 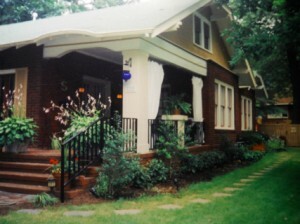 Just look at the curb appeal of this open front porch, and then look at the picture of when it was enclosed! I have never had so much fun subtracting heated square footage from a house! The hardest challenge of this improvement project was returning the interior brick back to its orignal color. 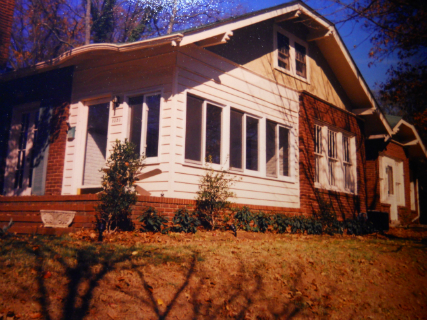 When they enclosed it, they left the brick walls exposed on the inside room and painted them white. I know your thinking I had the brick sandblasted, but I didn’t. I painted it with a like color matching the exterior brick. I used a paint sprayer and then a sponge with a slightly lighter color of the brick to match the existing brick. I of course had to build a corner support (column) and add a handrail. is soul felt and honest. to your soul and wings to your ideas. “My Heart is happy, light and full of love. “Without winter, how could we possibly appreciate the spring“? 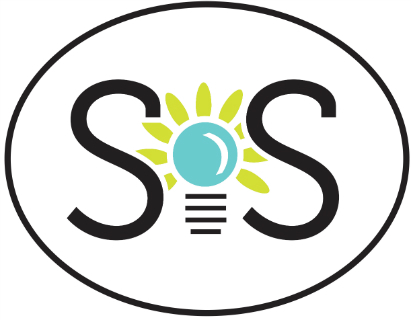 that must conserve our resources, draw inward, and allow ideas and situations to hibernate and awaken in their own time. of patience and the joy of discovering new inner strengths, as we wait for growth to emerge. to release the old in order to prepare ground for the new. A Reflection: I rest in the night to be ready for the day. seem unchanged at the surface: we may become doubtful or frustrated by an apparent lack of movement. like carefully setting brick upon brick, building slowly and steadily until one day we step back and realize the house is completed. about how far you have already come and trust in the process. “We can fail only if we fail to try”. In our society success is synonymous with two things: Money and Power. But the universe measures success by entirely different standards. First of all, to the angels money and power have no value in and of themselves. If money and power are employed for the good of all , then the person who has them could be deemed successful-not for having them but for the accompanying sense of gratitude, compassion, and generosity. Second, there is no such thing as failure, because everything we do is part of the discovery process. We can fail in life-fall short of our souls mark-only if we fail to try, explore, or take a risk. If we live according to our values, do what we love and are inspired to do, and are not afraid to experiment with life, we are automatic successes, no matter how much money we make or how high a position we have attained. If you haven’t yet achieved your goals, work at learning from your experience while enjoying the process.. I explore, I risk, I learn, I succeed.